THE BODENSEE-ARENA - jeo2019s Webseite! The Bodensee-Arena is an ice rink in the municipality of Kreuzlingen in the Swiss canton of Thurgau. 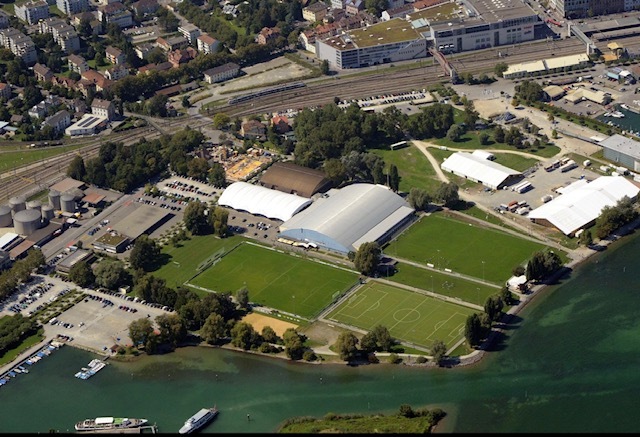 It is the home venue of the Ice Hockey Club, EHC Kreuzlingen-Konstanz. From 1999 to 2009 it was the venue of the Hockey Club, HC Thurgau from the second Swiss League. Located directly on Lake Constance and on the German border to Constance, the arena was opened in February 1978 and has an official capacity of 4,300 spectators for ice hockey matches and can be expanded to up to 6,000 seats for events. The Bodensee Arena was renovated in 2000. In 2002 a covered outdoor ice rink was opened, which was renovated in 2005. In addition, the arena has an adjoining hotel on the east side (lake side).